Raila Odinga, popular Kenyan opposition leader, has emerged as presidential candidate for the National Super Alliance, NASA.The announcement was made at a massively attended rally at Uhuru Park, Nairobi, on Thursday. Before the announcement by an alliance of six different political groups, there were fears and skepticism in the media that the current alliance might go the way of past alliances in the country that were fruitless, due to disagreement among alliance leaders, about who should lead. As at the moment before the arrival of the alliance leaders at Uhuru Park, the widely reported rumors about a disagreement between Odinga's group and William Ruto's group about who would be the flag bearer group. 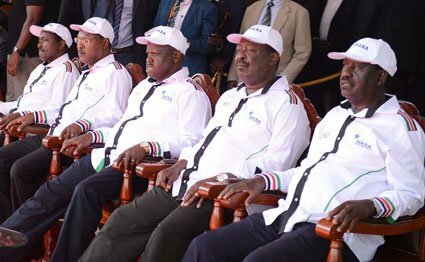 The eventual emergence of Odinga has put an end to that uncertainty, which curious political observers say now put NASA in a position to campaign vigorously around the country preceding the elections. The fear before the announcement was that, if NASA leaders are unable to agree on who should lead among them three months to the election, it could mean having no time to allow voters to make up their mind about who to vote for in opposition to the current leader, Uhuru Kenyatta. Observers say that the reason behind the broad based alliance is informed by the difficulties it often entail to defeat a sitting leader, who has all apparatus and finance at disposal against the opposition.